The Solstice Inflatable Dock is a durable activity platform. Use it in the lake or in your pool for summer fun. The Solstice inflatable dock is made of 1,000 Denier 3 ply PVC reinforced fabric material and comes in 4 convenient sizes. Add a couple of lawn chairs and turn it in to a fishing dock or strike your favorite yoga pose. Floating lake platforms are fun for the whole family. 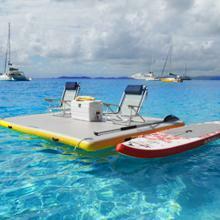 The floating inflatable dock is equipped with eight handles to help with boarding and boat tie downs. Solstice Inflatable Floating Dock Product Details Size: 10' x 10' Brand: Solstice MPN: 31010 Item Weight: 63 pounds Super durable activity platform is made from high pressure drop stitched material for lakes, bays, harbors or in your pool Triple laminated material is 6 inch Perfect for kayaks, paddleboards, water play or simply lounging on chairs or towels Dock features a compact tote bag, 4 stainless heavy duty corner D Rings and 2 center D Rings for securing your cooler, chair, etc Solstice by Swimline Solstice new remarkable inflatable docks are made with the same super tough drip-stitched material used on i-sup's, they offer amazing marine and leisure features. Use as a floating resorts and add your own cooler, chairs and umbrella. Can be Anchored using the deck D rings, easy to board using the 8 assist handles on the outside gusset. Makes a terrific yoga deck! create a great extension of a boats swim stem, easy to tether to any size boat, quick to inflate/deflate using high volume H3 valve. Inflate, drop an anchor and enjoy the day. Not for jumping off of and only to use in sheltered lakes. 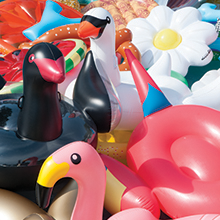 Luxury pool floats, toys & games to keep you floating in style. 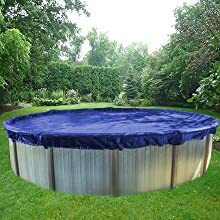 Liners & covers to keep pools in shape for all seasons. Maintenance equipment to support all of your pool needs. High end water sports and boating merchandise.